As you read this, I’m schlepping totes, a tent, a tarp and all the requirements for Nutella s’mores (yep, that’s how we roll) into the back of our pick-up truck. J and I are headed south for a brief summer holiday on the other side of the border. It was where One-Eyed Willie’s long lost treasure was finally found by seven curious adolescents. It’s the place Detective Kimble tried being a kindergarten teacher on for size. It’s the beach where Johnny Utah finally put the cuffs on Bodhi, only to release him to the rogue waves for the final ride of his lifetime. 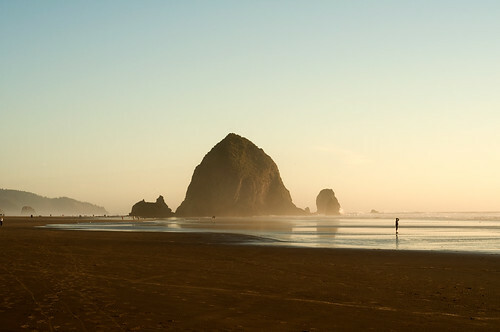 The Oregon Coast has been calling our names for quite some time, so all three of us – Jordy included – are southbound to the State of sunsets and sand dunes. Until next week, blog posts are on hold but I might check in on Twitter or Instagram [keiraannemellis] from time to time. Don’t forget that you still have a chance to win one of four pairs of one-day passes to the 30th Annual Filberg Festival. And while you’re at it, your donation to my Paws For A Cause campaign can nab you a pretty fabulous prize, so donate now. My goal is to raise $1,500 by September for the Comox Valley SPCA. Enjoy your weekend – see you back here on August 1st! I love the Goonies reference.